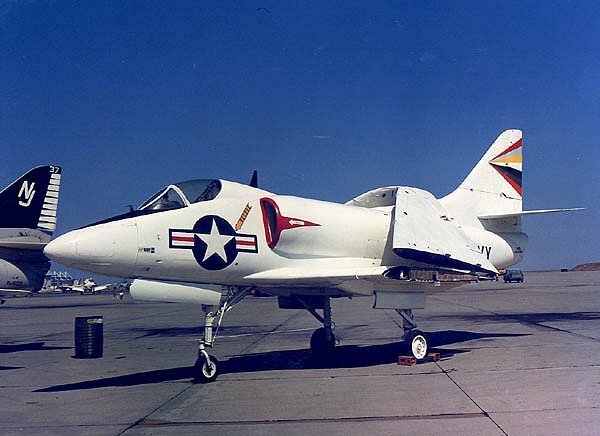 While no folded wing A-4's were produced by Douglas, three stricken and gutted A-4's were modified for public relations purposes, one each at NAS Lemoore, NAS Jacksonville, and NART Atlanta. All three had folding wings and vertical fins for overhead and side clearance during ground transportation by flatbed trailer. ©Photo taken by and from the collection of Bill Kistler. The A4 at Hangar #1 on Tuesday, November 30, 2000 via tractor-trailer from Memphis, Tennessee. 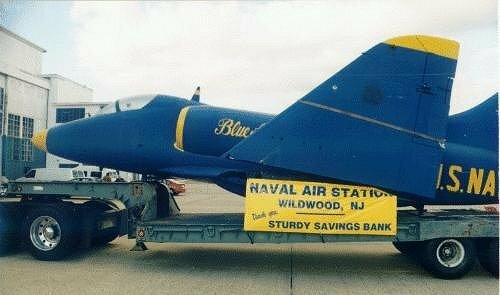 The aircraft is on permanent loan to the NASW Aviation Museum from the U. S. Navy and is festively painted blue and yellow. The A-4 is currently on display at the NASW Aviation Museum. 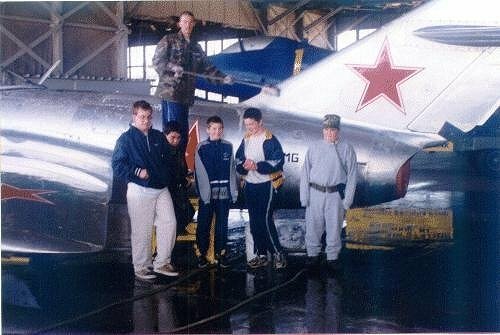 The photo on the right you can see the Skyhawk in the background inside hanger #1. Photo from the collection of Tom Bispo. ©Photo taken by and from the collection of Harry Gann. Photo on left notice the Blue Angels F-4J in the background. This photo was taken at an NAS Lemoore airshow.